Kmart's Christmas in July: Inspiration or Desperation? During these dog days of summer, the nation's department stores are still cold. According to the retail-sales statistics released by the Commerce Department on July 14, June department store sales dipped 1.3% compared to sales in May of this year, and were down 9.4% compared with June of 2008. So to prop up sales before the back-to-school season, one major player is asking Santa, of all people, for some help. Sears Holding Corp., which runs both the Sears and Kmart department stores, is running a Christmas promotion a full five months before Saint Nick leaves the North Pole with his reindeer. On both the sears.com and kmart.com homepages, customers are invited to "Shop Christmas Lane," and are directed to deals on holiday ornaments, stocking stuffers and other winter-related merchandise. The Christmas goods will also be on display in 372 Sears stores throughout the country; the promotion runs through July 25. With temperatures simmering and families spending summer days at the shore, most customers aren't exactly in the Christmas spirit. So what convinced Sears, which has seen nothing but annual same-store sales declines at both its namesake and Kmart stores over the past four years, that skeptical shoppers want to open up their wallets for Christmas gifts now? "After the last holiday season, customers told us that they wish they had seen some of our merchandise earlier," says Natalie Norris-Howser, a Sears spokeswoman. "People are buying earlier today. Also, customers have grown accustomed to the Christmas-in-July terminology, so we wanted to leverage that." Norris-Howser also pointed to the company's generous layaway offers for bigger-ticket items as an incentive for shoppers to do their holiday buying today. In today's environment, any move that attracts attention might be worth it. "Overall, it seems to be a pretty smart strategy," says Pete Blackshaw, a brand strategist for Nielsen Online. "Doing it on the Web makes a world of sense. They are clearly getting some buzz, there's a novelty effect. At a time when everybody is going to be competing around November to get attention, this is a good opportunity to potentially get in front of the line." Blackshaw, who monitors how brands are perceived in the social-networking sphere, says the Christmas marketing has gotten positive feedback on Twitter. The move, however, may also send a more downbeat message to some shoppers. "It looks more like desperation than inspiration," says retail consultant Burt Flickinger III, managing director of Strategic Resources Group. "It may be a sign that Kmart's spring and summer inventory is not selling through." And Santa certainly isn't going to save Sears and Kmart, retailers that seem increasingly irrelevant in the Walmart/Target/Home Depot world. For example, as Morgan Stanley analyst Gregory Melich writes in a recent equity research report, "Sears Holdings' underinvestment in stores has degraded its ability to withstand the magnitude of the current pullback in consumer spending." Whether you're a fan of early Christmas or not, get used to it. To get a jump start on what might be a horrid Christmas shopping season, experts anticipate that stores will move up Black Friday, and perhaps begin their holiday marketing around Columbus Day. "Overall, I think you're going to see a lot of this on the retail front," says Blackshaw. "They're going to be looking for novel strategies to drive competitive advantage, even if they have to rethink the typical calendaring of events." In this depressed retail environment, however, can Santa deliver the goods? See pictures of Santa gone wild. 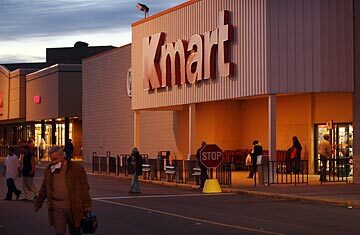 Read about Kmart's emergence from bankruptcy.